Why go look for the best swim bag, rather than picking the first that comes your way? This is to make sure the bag you will take home will suit your kind of outdoor ventures, provide the needed space and keep safe your tools. We’ve done the groundwork for you. We chose 7 of the best out there on the market. Things have changed over time in terms of swim bag usage. Compared to before, we now put more things into these bags. Before there were just swimming goggles and a piece of swimsuit to put in. Now, some people need to carry a waterproof fitness tracker. If you are one of them, you need an extra pocket on your swim bag to hold your tracker. Those who love music can’t go through the day without taking with them some music tools. For pool buffs in this group, they need to bring with them their MP3 player for swimming and waterproof earplugs for swimming. This is to make sure that every minute spent outside will also be a chance to enjoy their favorite music. People have more varied needs today, so you can see a lot of them bringing paddles, snorkels, fins and all the rest that suit their swimming needs. What are your swimming needs? Your answer to this will help you decide which gadgets are vital to bring. This will further lead you to pick the right bag size. So never forget to check the amount of space inside and the bag’s length, width and height. Common issues for returns are about the confusion on size. To save time, check it to make sure that the bag is not made as a kids swim bag. 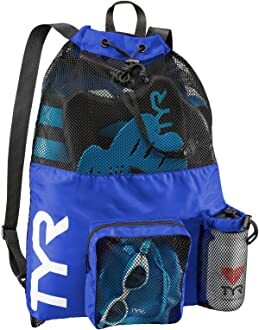 Boys swim bag or those that are for small girls usually appear bigger in online ads than in person. So make sure to ask. Next, look into the weight. While being roomy inside and having a zipper pocket on the outside for storing small items, the bag should also be light. The bag’s body should not add too much bulk or weight for easy carrying. More than outside beauty, you may do better with a swim backpack that has chambers. Check the ones with two chambers. One chamber is for wet clothes and the other for dry ones. The one for dry clothes usually has a plastic walling. Read reviews if the kind of barrier that it has can keep moisture from moving to the other chamber. Also, it is good if the chamber for wet items can also be used for storing dry clothes at times when the user is out but not doing water sports. Check for the material used in making the bag. Is it thick and sturdy? Is it easy to clean and dry? You want that bag ready for you even on busy days. Make sure that it doesn’t take a lot of time to dry after washing. Check for its ability to resist heat. Some bags can’t stand the sun’s heat. If you are the careless type, you can sometimes throw your bag on the hot sand while you head off to cool your body in the water. Makers come up with new and high-end options for buyers looking for a waterproof bag for swimming. Look at the pricey ones first. That is if you want yours to be truly water-resistant, easy to dry and sturdy. You might also check cheaper options to compare, but you can do that later. Check corners and stitches. Some makers have low quality control on their bags’ pockets, drawstring, etc. The pocket’s zipper and the drawstring stitch and material should be durable. Or you might end up with a bag with broken zipper, or a drawstring cut off from the main body or corners with holes. Some bag makers go as far as offering warranty for their items. It shows they trust their products. Buyers are also less anxious buying knowing that their hard-earned money is safe. You may also check their return process. Some suppliers lie in their advertisements. Ask if they charge for delivery for returned items. Now, product send-back is hardly our business here, and we hope it doesn’t happen to you. So we’ve picked only the best for you to choose from. Here’s the cream-of-the-crop based on our review. Starting with Speedo, we have here a great series of bags coming in diverse colors. But none of these pass as girls swim bag or for boys. They are too big for kids. It comes with a drawstring closure and zippered pockets. Great for keeping things secure. It holds plenty of things. With a small towel, a big towel, sweatshirts and pants inside, there’ still lots of room to spare. No sections to keep dry and wet clothes apart. Check also for stitching. Someone said the one he bought should have been double stitched. This one also comes in various colors and in a size akin to the Speedo. It has a meshed venting system that allows easy drainage and drying. There are barrel-lock closures that provide quick access to gears. Over-the-shoulder straps for easy movement. Mesh system keeps things fresh and odor-free. Some people like a bag this big to have a place for water bottle. It has none. Same can be said on the Speedo. No over-packing for this bag if you want to keep it intact for a long time. Looking for one with lots of mesh? This is it. The Adoretex is a perfect example of a bag with 100% mesh design. 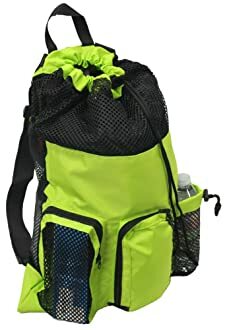 It is light and features a backpack strap for easy transport. Meshed pockets are roomy. That allows for plenty of spaces for drying. Check the size. You might find it small for you. This one is great to consider for children as a gift. Stitches might tear out when carrying more than 15 lbs. This is one of the highest rated out there. It’s probably because of the many compartments it has for dirty clothes. 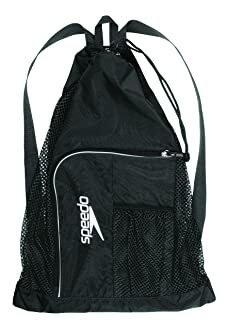 That and its mesh panels for fresh air supply are the ones that stand out for this bag. Durable bag. You can give it as a gift to a young kid that’s rough with just about everything. It is another champ when it comes to storage space. What makes it better than others is its large space for used clothes. Materials look cheap, but if you will look deeper, what you see is a durable set up. For this bag, you have to put stuff in the right places. If you mess that up, you‘ll have shoulder straps that sit a little funky. 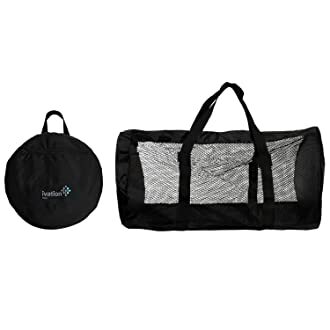 Another model designed for great ventilation is this foldable swim bag. It’s about the size of the other bags above, but the design is mainly for holding water equipment. This bag has tiny holes to keep fresh air coming in. Shoulder straps can be removed if user wants to use carry handles. This bag can be collapsed and comes with a built-in storage pocket. Has a remarkable design in terms of air supply system. Comes only with one color, which is black. You may find it too flimsy if you want a bag that has a heavy-duty quality. If you are into many things in life, this all-purpose bag might be the best companion. You can use it as a travel bag, a gym bag, overnight bag, airline bag, shoe bag – or just anything you can think of. It’s got reinforced seams, so it’s not easy to tear at the corners. The material is waterproof polyester nylon. It uses rugged hardware that doesn’t rust. Nylon lining is rip stop. It comes only in two color options – the one with the bluish strips and the other with the grey strips. Some say the zipper of this bag is a little fuzzy. Probably one of the smaller options, but surely, this bag deserves your attention. It is a bag that is made to last and stand up to the toughest place in the world – your kid’s school. This bag is the only one in our list that comes with a guarantee. Enjoy 12 months guarantee from the manufacturer. Materials used are 2-3 times thicker than others. Seams are double-stitched and reinforced. Drawstring is too long it can get caught on things. There are no air vents on this bag. Even though the Zavalti is the only that comes with a guarantee, we were not inclined to pick it as the best. We went for a durable option that sadly does not offer a guarantee. We’ve opted for the ASICS as our best swim bag. What wowed us the most is this bag’s mesh side panels, although it is not the 100% type that Adoretex sports has. Sometimes, too much mesh vents lead to weak make-up. 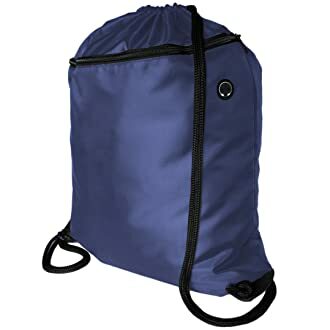 Sufficient air supply is enough and for this bag, ventilation is fairly enough to support its many spaces for dry clothes. 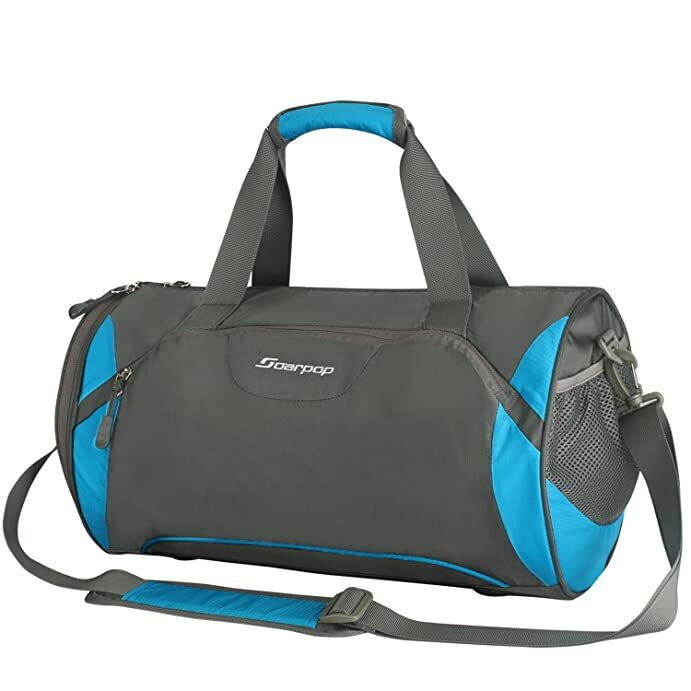 We also like that it has durable materials that make this bag able to stand up to the roughest of handling. Storage space is also enough for bulky gear. 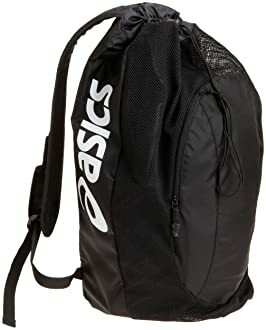 This bag’s also light and comes with padded shoulder straps for injury-free shoulder carrying. Just put a little effort when putting things inside, so that the straps will remain in their proper position before you carry the bag.